The final WWE DVD of 2018 is a round-up of what is considers to be the best of the WWE Network’s 24 series of candid documentaries. The four chosen features on this two-disc set concern The Hardyz, WrestleMania 33 (called WrestleMania: Orlando in the show title), The Women’s Evolution (titled Empowered here) and Raw 25. In terms of the quality of each doc, that comes down to personal opinion on each of the presentations and the topics covered. Certainly, the main feature on Matt and Jeff is the most gripping, at times being excruciatingly honest about the truly dark times in each brother’s life before they turned things around for the better. The WM 33 section is fun in terms of reliving the main card, but is less enticing in part due to the heavy focus on the John Cena-Nikki Bella proposal, given that they supposedly split earlier this year and, while question marks remain over whether they are together or not, even a feel-good spotlight on the duo wouldn’t make for the best TV (sorry to fans of Total Divas and Total Bellas). Empowered is a follow-up to a 24 special on the female division from 2016. The bigger emphasis here is on the first ever women’s Royal Rumble match, and while it’s cool to realise how far the women in WWE have come, it still feels too much like WWE propaganda and revisionist history. Finally, Raw 25 provides a cool behind-the-scenes look at the historic episode recorded in two venues last January, but it conveniently glosses over the somewhat negative reactions that people had to the episode (it has the feel of “this is great, no matter what we do!”). Another issue with the DVD is the fact that, if you have the Network, you’ll have seen all of these documentaries or at least have access to them, but even if you haven’t, it feels a bit thrown-together; we’ve already had DVDs on The Hardyz, the women and Raw 25 this year, and each main feature would have made for a nice bonus on those sets. Here, though, it just feels – lazy, I guess? Historically, the final WWE DVD of the year has been a must-own due to the Christmas festivities (because fans would be more inclined to purchase the new collection in time for Xmas), so it feels like a bit of a let-down to be honest. There are a fair few extras thrown in (the Raw Tag Title four-way Ladder and SmackDown Women’s Title Six-Pack Challenge bouts from WM 33, The Ultimate Deletion spectacle, Koko B. Ware vs. Yokozuna from Raw #1, the McMahons/Austin segment from Raw 25, and Charlotte facing Ruby Riott and Asuka at Fast Lane and Mania respectively), but again they mostly feel like filler (Ultimate Deletion is the only part that has been previously unreleased). It’s almost as if the WWE DVD team had to cover a gap in the schedule, couldn’t think of anything exciting, so they decided on this concept, one that I doubt will generate much excitement. This isn’t to say that The Best Of WWE 24 isn’t entertaining or insightful, because it is. And if you haven’t previously seen the documentaries, maybe you will check it out. But compared to other DVDs released this year, it feels like a pointless release. 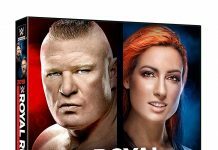 If it reaches a bargain-level price in the shops, then maybe give it a look; otherwise, The Best Of WWE 24 is just another DVD, and a disappointing end to the year for WWE Home Video.